The John Deere X300 has two main safety switches. One switch prevents the machine from starting if the operator has not followed the proper starting procedure. The other switch prohibits blades from turning when no operator is present. The first switch is located under the parking brake, and the second is found under the operator's seat . If one or both of the switches malfunction, the lawn mower's engine won't turn over or personal safety may be at risk. Determining the bad switch requires a few short steps. The procedure takes 10 minutes. Park the lawn mower on a hard, level surface. Sit in the operator's seat and depress the parking-brake pedal on the left-hand side of the front fender. Turn the ignition key. If the engine fails to turn over, the parking brake switch may have malfunctioned. If the engine turns over, the operator switch is to blame. Locate the parking-brake safety switch under the front fender on the left-hand side. Two bolts hold the switch to the frame. Remove the bolts with an 8 mm socket wrench. Unplug the switch from the wiring harness. Plug in a new parking-brake safety switch and reinstall the two 8 mm bolts. Sit in the operator's seat, depress the parking brake, and start the engine to ensure proper installation. The engine should turn over with the parking brake depressed. Park the lawn mower on a hard, level surface. Sit in the operator's seat and depress the parking-brake pedal on the left-hand side of the deck. Start the engine and release your foot from the parking brake. 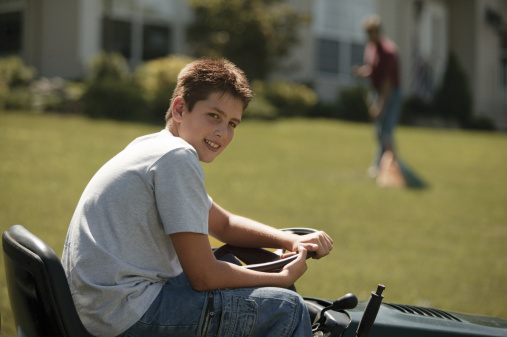 Engage the mower blades by pulling up on the power-take-off (PTO) switch on the left side of the steering wheel. Lift yourself off the operator's seat, but do not get off the machine. If the engine stops and the blades disengage, the seat safety switch is working properly. If the engine keeps running and the blades stay engaged, the switch needs to be replaced. Turn off the lawn mower, and set the parking braking. Remove the key from the ignition. Flip the operator's seat up toward the steering wheel. With a flat-head screwdriver, pop off the seat switch from the bottom of the seat pan. Unplug the switch from the wiring harness. Plug in a new seat safety switch by pushing the switch into place. Restart the machine and retest the switch to ensure proper installation. If the mower continues to run and the blades fail to disengage when you lift your body from the operator's seat, turn off the machine and contact a reputable service center. 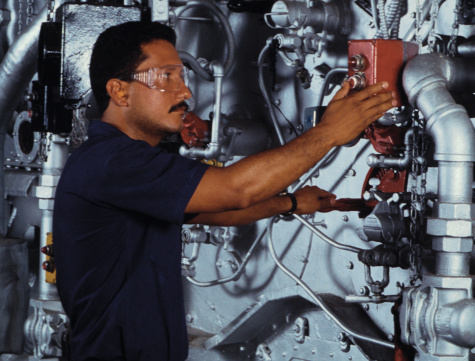 Operating the machine with a defective switch risks serious injury. How Does a Compressor Lock-Out Switch Work?